A bit of a mixed day weather wise, a wet start, then flat calm, then dry, then a right old gusting wind near the end, and not the warmest either..! With the ponds only thawing on Thursday night, it was always going to be tough, and so it proved. The odd ” bonus fish ” would make all the difference today, and John Williamson took full advantage catching two good 2lb + bream at the start, a few small blades and then finishing off with a 4.5lb Carp in the last 20 mins, enough to secure him the overall win with 12lbs 8oz, all caught on the tip rod / cage feeder. Don Lines finished 2nd, catching a mix of silvers with one or two better fish, again all on tip rod to take 2nd place with 10lbs 8oz. 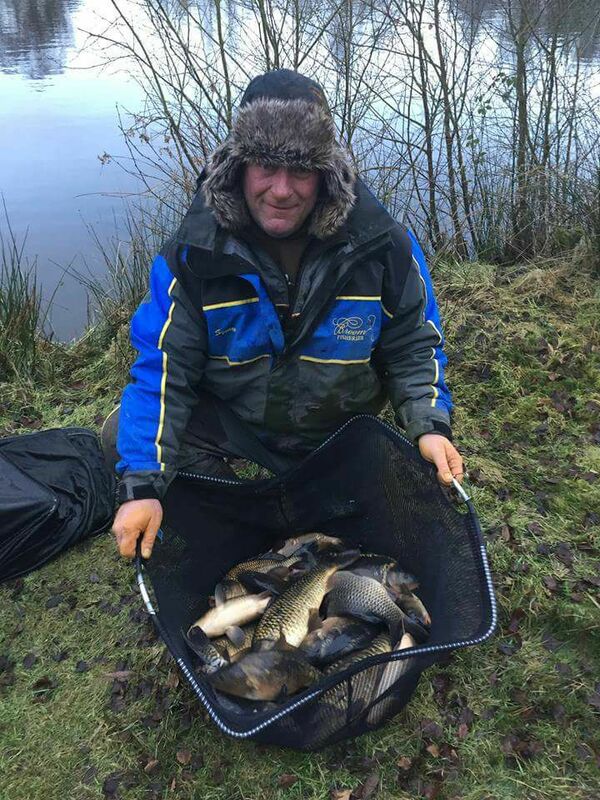 Matthew Waugh secured 3rd with a few small roach, a good skimmer and an ide for 6lbs 3oz. A tough day for most with the fish not really feeding much.